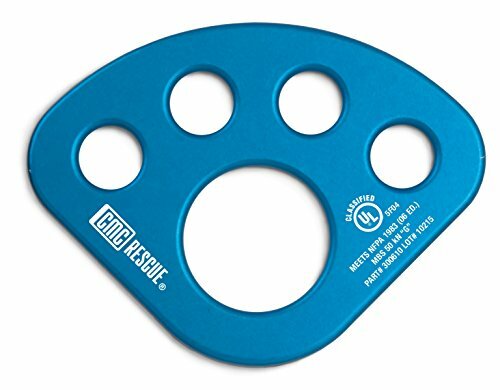 A Classic CMC Innovation A CMC original design that has withstood the test of time, our Anchor Plates keep the carabiners holding the different parts of your rescue system from jamming together. The hardware becomes easier to see, making safety checks more accurate. It can also keep you from clipping a carabiner into the wrong loop of the anchor web. For anchor systems, it makes an excellent collection point. We use the Anchor Plate in CMC Rope Rescue classes, which allows our students to set up systems faster with fewer mistakes. Hole diameters: small - 7/8 in (22 mm), large - 2 in (51 mm). Twenty years ago CMC introduced the Anchor Plate as a strong, lightweight, and compact collection point for connecting a rescue system to an anchor. And that point is an important feature. Over the years we've seen a steady progression of "bigger, better" anchor and rigging plates with more and more holes entering the market. But the bigger the plate, the less like a collection point it becomes, increasing the potential for rotation of the plate, creating additional system extension and shock-loading if any movement or failure of an anchor occurs. In 20 years of use, we've not seen an operational need for more holes, a larger size, or more weight. Product Tip: Besides serving as the point of distribution to any number of secure anchor points, rigging plates also serve the benefit of aligning the separate lines of a rigging system in distinct order, keeping multiple and various lines orderly. One tip when determining complementary gear to use with rigging plates; consider the versatility swivel pulleys can lend to the rigging system. They introduce rotational movement into the rigging lines running from the plate because the swivel pulley can rotate as needed to provide enhanced in-line ability to clear other components within the system.